MIAMI, FL -- Hispanic Market Overview – 2011, presented by Telemundo, the highly anticipated follow-up report on how marketers and advertisers can best-target Latino consumers, has been released by the Adam R Jacobson Editorial Services and Research Consultancy and HispanicAd.com, the tool for the Hispanic advertising and media professional. Distributed exclusively in the U.S. Hispanic market by HispanicAd.com, this year's edition includes enhanced content and detailed information on population trends and consumer activity among Latinos, provided through a strategic partnership with business intelligence and multicultural market research firm Geoscape. 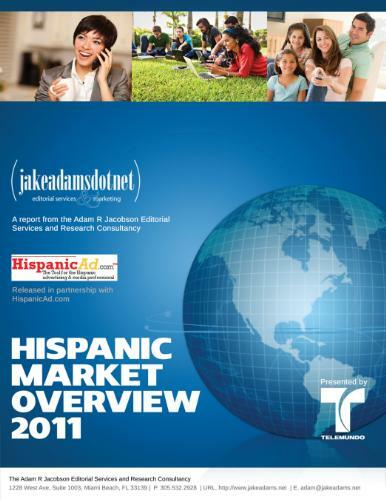 Available as a free download from JakeAdams.net and HispanicAd.com, Hispanic Market Overview 2011, presented by Telemundo includes a detailed look at the U.S. Hispanic consumer, with Geoscape-provided data on population, language preference, income trends and spending. This year's edition also features insight and analysis on Hispanic advertising from key leaders in the industry, representing multicultural agencies, Spanish-language television, Spanish-language radio and Hispanic print and online media. Hispanic Market Overview 2011, presented by Telemundo also shines the spotlight on the out-of-home segment, Direct Response advertising and the growing call for Spanish-language call centers. New for 2011 is a breakout section on the rapidly growing Hispanic health and wellness category, which has seen new radio and television programming and the rise of an internet portal devoted specifically to the hot topic. "This year's report, the fourth in our year-old series of free-of-charge Overview reports, is without a doubt our best one yet," said Jacobson, who launched his consultancy in January 2010 following his departure as senior associate editor of Hispanic Market Weekly. "It is chock-full of great information and packaged in an easy-to-read format. Best of all, we're helping to share the powerful opportunities for savvy marketers and advertisers that exist throughout the U.S. Hispanic market. And, there is no subscription needed to access this vitally important data." Other partners for this year's report include Azteca America, CallZilla, Dr. Felipe Korzenny, ESPN Deportes, Fox Deportes, GLR Networks, Hola Networks, impreMedia, Posterscope, SaludyVida.com and Zipcast. A sold-out webinar hosted by Geoscape's Savvy University, set for 2PM Eastern on February 15, 2011, will be available on-demand shortly. For further details, visit http://geoscape.com/savvyu.asp.